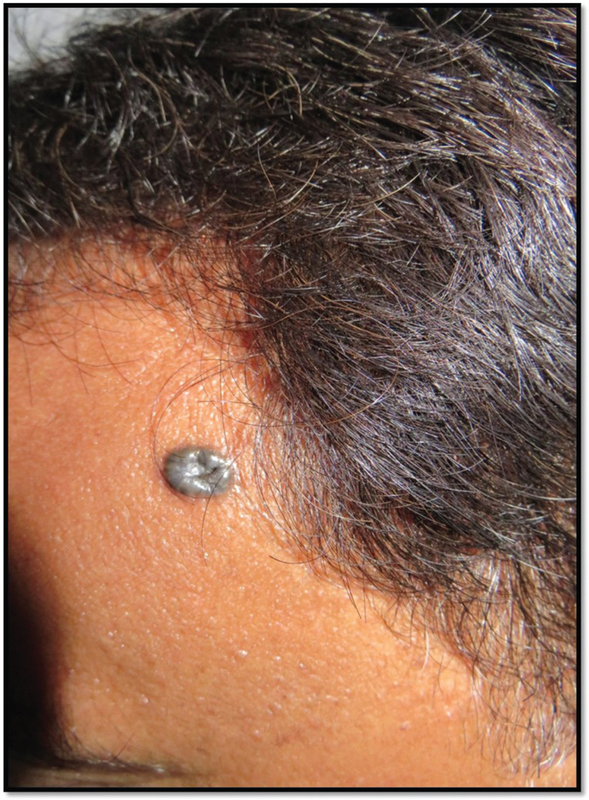 A 42-year-old male presented with single asymptomatic dark-colored lesion on left side of forehead which erupted 10 months ago. Examination revealed single, well-defined, hyperpigmented, waxy nodule with central depression over the left temporal region [Figure 1]. Dermoscopy (eScope, magnification 10×, polarized light) revealed absence of pigment network, blue-gray structureless areas, linear telangiectasia, and shiny white chrysalis-like structures [Figure 2]. Histopathology revealed multiple well-demarcated islands of basaloid cells with peripheral palisading, with clumps of pigment [Figure 3]. The diagnosis of pigmented basal cell carcinoma (BCC) was made on clinical, dermoscopic, and histopathological findings. BCC is the most common skin cancer and presents as a pigmented lesion in 6.7% to 8.5% of the cases. Pigmentation is seen in more than 50% of the tumors in Asian population, whereas less than 10% of BCCs are pigmented in fair skinned individuals. Dermoscopy has greatly enhanced clinical diagnosis of pigmented skin tumors. The diagnosis of pigmented BCC is made on the dermatoscopic absence of pigment network and the detection of one of six positive criteria: arborizing vessels, large blue-gray ovoid nests, ulceration, maple-leaf-like areas, spoke wheel areas, or multiple blue-gray dots/globules. Chrysalis-like structures are shiny, white, orthogonal linear streaks which are prominent under polarized dermoscopy. 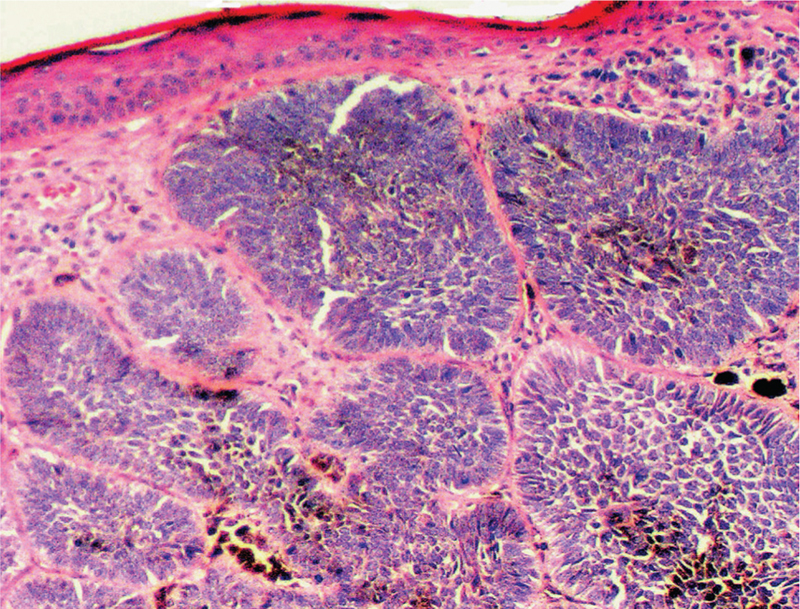 On dermoscopy, pigmented BCCs are always asymmetric in pattern, and because of their irregularity, the differential diagnosis of pigmented BCCs includes both invasive melanoma and benign pigmented lesions. Dermoscopic findings of melanoma are atypical pigment network, presence of four or more colors, blue-white veil, atypical vascular pattern, irregular dots/globules, irregular streaks, irregular blotches, regression structures, and peripheral radial lines or pseudopods. Benign nevi patterns include presence of pigment network, homogenous color, diffuse reticular, patchy reticular, and globular (regular). 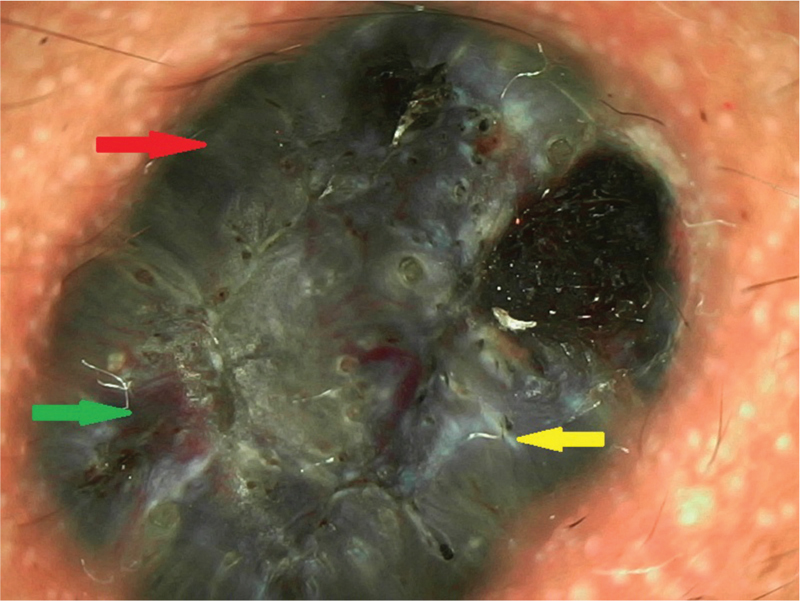 Thus, dermoscopy is a useful tool in differentiating between pigmented BCC and melanoma and nevi. Trigoni A, Lazaridou E, Apalla Z, Vakirlis E, Chrysomallis F, Varytimiadis D et al. Dermoscopic features in the diagnosis of different types of basal cell carcinoma: A prospective analysis. Hippokratia 2012;16:29-34. Lallas A, Apalla Z, Argenziano G, Longo C, Moscarella E, Specchio F et al. The dermatoscopic universe of basal cell carcinoma. Dermatol Pract Concept 2014;4:2. Marghoob AA, Cowell L, Kopf AW, Scope A. Observation of chrysalis structures with polarized dermoscopy. Arch Dermatol 2009;145:618.